Soup Per Bowl Sunday: Friggin BLT Soup! 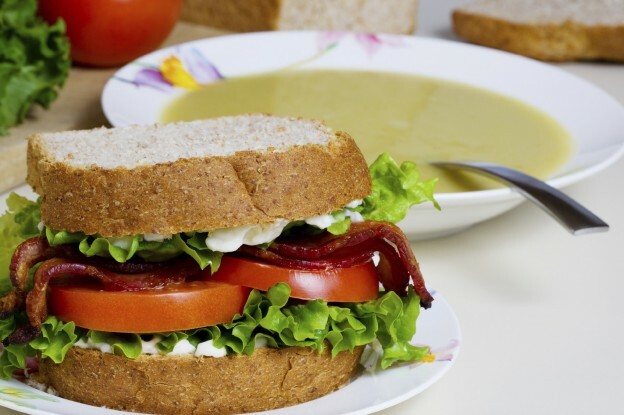 recipe helps you to use your leafy greens while eating your favorite sandwich… as a friggin soup! Mind. Blown. Place potato and fennel on a baking tray and brush with olive oil. Bake at 375 degrees F until tender (about 20 minutes). Melt butter in a medium pot and saute onions until translucent. Add garlic, fennel and potato and chicken stock. Cook for 3 minutes than add lettuce. When the lettuce is wilted (about 2 minutes) remove soup from stove. Blend until smooth, then serve with tomato and bacon as garnish. This soup is seriously delicious! This recipe comes from our wonderful camping cookbook. Get your copy of the Flaming Marshmallow’s Guide to Campfire Cooking.